There may be times in your marriage where you feel it is untenable to remain in the marriage…yet you’re not quite sure if the situation warrants a permanent dissolution of your marriage. In such instances you may feel that you may wish to live separately from your spouse while you consider the situation. Where both parties are in agreement to separate without filing for divorce, an informal agreement can be reached via a Deed of Separation. Whilst the Deed is not a legally binding document and does not need to be filed in court, a lawyer needs to be present to witness the signing of the document. The Deed can be rescinded at any time with the mutual consent of both parties. 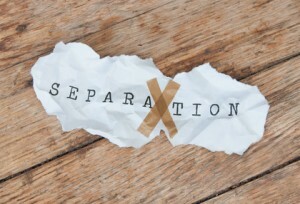 Click here to read more on Deed of Separation. Seeing a lawyer for the first time – What do you need?